Elizabeth Hansen - Call on Dolly! 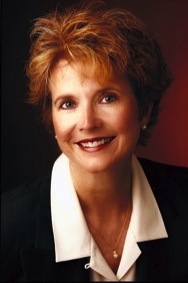 Elizabeth Hansen played Irene Molloy in the Twentieth Anniversary tour in 1983 and ’84. 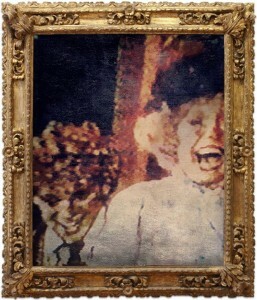 Elizabeth had never seen Dolly prior to performing in the show, strangely enough. Of course, she knew about it. Who in the theater hasn’t known about it? Elizabeth grew up in Utah and her only exposure to the theater was the University of Utah. The landscape was pretty dry as far as theater is concerned. Basically all that Elizabeth knew about Dolly came from her hearing the hit song on the radio. Onna White called Elizabeth and told her that they were looking for a replacement for Florence Lacy who was leaving the show. This was for the national tour. She had never even heard Ribbons Down My Back prior to this audition! She found it just enchanting. What she loves about Jerry Herman’s music is that it was simple yet complex. It is like that with Rodgers and Hammerstein’s music, as well. It is all so lovely and memorable. Having no prior history with Dolly, Irene was not a sacred character to Elizabeth when she took on the role. She was able to put her own spin on it. Interestingly enough, prior to getting this role, Elizabeth was studying with Charles Nelson Reilly. He was Elizabeth’s first acting coach in Los Angeles. She is still devoted to him. He was “absolutely friggin’ brilliant.” After getting cast, Elizabeth did discuss Dolly with Reilly. Elizabeth was living in New York at the time and had not seen Reilly for a couple of years. She remembers him talking of Eileen Brennan. One of the things that Elizabeth remembers him saying was that Brennan was very disarming in that role. In the original casting, Reilly and Brennan were the antithesis of romantic leading characters. Even though Elizabeth is not a character type, she wanted to grab part of that fun loving “spit in everybody’s eye because I’m not doing what society says I should do” nuance to the character. She was looking for the joie de vivre for the character. Having done the show, Elizabeth now thinks it is a delightful show. It’s still being done and Elizabeth realizes there may be some out there thinking, “Oh no! Not Dolly again!” She did the same thing when she heard they were holding auditions but she went, it was a job. She now feels that it is so perfectly made. She would absolutely love to revisit Dolly. She would also love to have the opportunity to play Dolly Levi. Director Dennis Courtney (see chapter on him) says he has a list of “whys” when approaching a show. There were two whys as to why Elizabeth wanted to do this particular production of Dolly. The first reason was that it was a national tour. It was the second female lead in a national tour! The tour was for a year and a half. 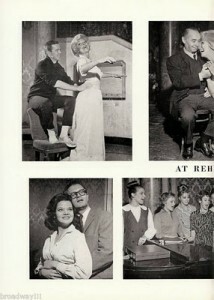 Florence Lacy was playing Irene Molloy prior to Elizabeth coming into the show. 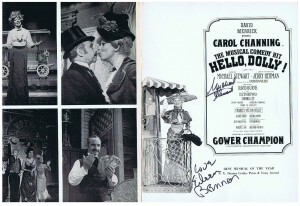 Elizabeth and Davis Gaines, as Cornelius Hackl, came in for the last six months of the tour. 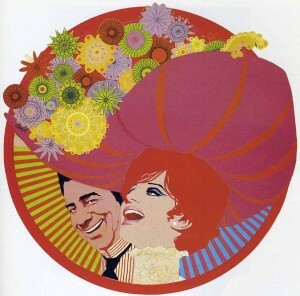 The second why for Elizabeth was that she was a huge fan of Carol Channing’s because of Thoroughly Modern Millie. The opportunity to work with one of her idols, Julie Andrews and Shani Wallis being being two others. Davis Gaines was great as Cornelius! Here was this absolute stunningly handsome guy who transformed every night into this sweet, charming, bumbling guy that as Irene, AND Elizabeth, looked at and just fell in love with. It wasn’t hard for her to act like she was falling in love with this guy. The advice that Elizabeth would give to auditioning for the role of Irene Molloy is the same advice she would give to anyone auditioning for any iconic role, find the honest person within that character. Don’t play the stereotype which is what most people tend to do. Elizabeth had only been married a short time when this opportunity came her way and she was going through a bad patch in that marriage. Elizabeth brought her own wants and needs at that time to Irene Molloy. They are the same desires that Irene wants and it is really apparent. She is not only looking for a man, she is looking for someone to complete her in every way. In that time period, she wouldn’t have had a lot of opportunities, but she’s holding out for one person who is funny and charming and Cornelius! Her advice for herself each night was to hit the high note and enjoy it and have a good time. Elizabeth is very tall and statuesque. She and Carol played very well off of each other. They were opposites. Elizabeth was more of a “straight man” to Carol. Carol really enjoyed that as well. Elizabeth brought a regal charm and sophistication to Irene Molloy. The cool thing about being on a tour is that from city to city, the audiences change constantly even more than in a regular run in one theater. There were certain things that she kept because they worked well, but she also enjoyed when either Davis or Carol would have something occur spontaneously and then they could grab and play off of each other. They all had a certain “rehearsed” performance that you do and then you have enough experience and technique to be able to tweak it a little if need be especially if the audience is not as responsive. 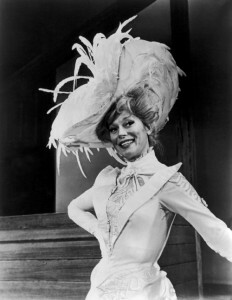 Elizabeth absolutely believes that Hello, Dolly ranks in the top five musicals she has appeared in especially for the last five weeks that they were in Hawaii. The star sets the tone for any show of what the tour will be like, of what these next few months is going to be. Channing was gracious, demanding, very no nonsense…especially on stage. You better be where you were supposed to be. If you weren’t, she would be talking to the place that you were supposed to be in. You would then have to get to that spot and be there. Channing treated everyone like family beyond the light of the show. Elizabeth used to love to stand in the wings of the theater before her entrances and watch what was happening on stage and then kind of breathe on. It was always this feeling of our special this particular production was. Carol’s generosity and professionalism led that production. That is exactly what Elizabeth adopted and has carried forth throughout the rest of her career. Elizabeth went on to do a national tour with someone who will remain nameless. That tour was a nightmare because that “star” was a “poophead.” Nowadays, Elizabeth is more directing and writing but she always tries to bring that graciousness and professionalism that she learned from Carol. The worst experience that Elizabeth had during her run was when she had the flu. Unlike MOST in the theater today, she did not miss any performances. Like Carol herself, she remained a trouper. It didn’t even occur to her not to. The only other production of Dolly since then that Elizabeth has seen is the movie. Just as Barbra says in my chapter on the film about being too young to play Dolly, Elizabeth thinks that is exactly what is wrong with the film. Elizabeth feels that Barbra was totally miscast. The movie ended up being a big cumbersome film. Patricia Ward Kelly, Gene Kelly’s widow, says that Gene wanted a simple film along the lines of The Matchmaker. Twentieth Century Fox wanted, and got, something bigger. Hello, Dolly! as done on the stage is not big and cumbersome. 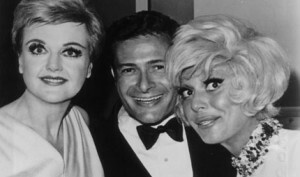 Jerry Herman is a delightful man according to Elizabeth. He was there for most of most of the rehearsals. 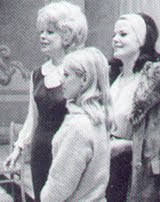 When the new cast members were put in, rehearsals were held in New York. They had ten days to get the show up and running. Elizabeth found him to be a lot like Carol, very gracious. He was also very understated. He was delighting on what everyone was doing. She found that to be wonderful of him. Lucia Victor, once again, was the director for this production. She stuck with the tried and true. Those that were coming into the show were being plugged in which wasn’t a bad thing. They arrived, got fitted, rehearsed, and opened in ten days. Elizabeth got her first professional job in ’78. She has seen many changes in the theater since then. One of the biggest changes is the demise of the legitimate voice in today’s mainstream musical theater which has given way to the belt, which saddens Elizabeth. There also is the loss of the more intimate musical or stage play. Like Hollywood, everything NOW has to be BIG and LOUD and BRASH. Elizabeth is looking forward to seeing ONCE. She is anticipating a lovely exception to the rule. Budgets have gone up and legitimate voices have gone out. Why does the Hello, Dolly! number ALWAYS stop the show? Elizabeth’s take is that by that point, the audience is all in love with Dolly. They want to lavish themselves in their love for the character. That last performance in Honolulu, Hawaii, was met with bittersweet sadness. Theatrically speaking, Hello, Dolly! was probably Elizabeth’s best experience in the theater. She loved doing the second female lead. She always loves being in the role because you don’t have to carry the show but you have enough recognition for great applause in the end. It was a delight. It is an iconic show. The reason Elizabeth thinks it has come iconic is because there is such heart in all of these characters and she thinks it rings true with an audience. It rang true for her.